More info:Child (under 16) USD$2650 Local payment USD$200 Bike Hire (if required) USD$250 Single supplement if requested USD$850 Prices include: transport, support vehicles, meals as stated in itinerary, accommodation & activities for the duration of trip. - Small group size – Our groups really are small! With a maximum of 12 in any one group we minimize our impact on the small communities that we visit. - We support local economies – buy locally made products, use local accommodations, restaurants, markets and support small businesses. (Buying locally made products also decreases the environmental cost of importing). We also employ local drivers and guides in the countries we visit. - Encourage positive interaction and social exchange – again by supporting locally run businesses (and by travelling by bike!) we develop relationships with local communities and families on our trips where our clients from all over the world can meet and engage one to one with local folk; Also by learning the local languages. - Waste/rubbish management – when we travel we should treat our surrounding as we would treat our home (or better!). We do our best to avoid ‘single use packaging’ only using reusable or recyclable packaging. We recycle what can be, and manage any rubbish in the best possible way e.g. all of our organic waste is feed to local domestic pigs and goats, and we always leave our picnicsites as we find them (or better!). Environmentally conscious office – To avoid paper waste we aim to use as much computer technology as possible in our office. We only produce a minimum of hard copy advertising/brochures/flyers etc… and we consider the source of materials used. 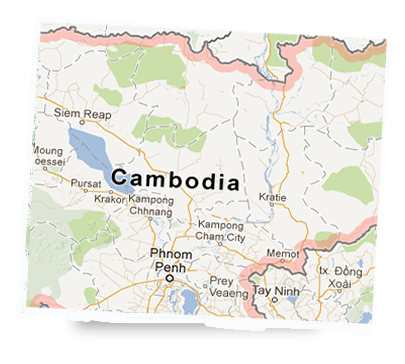 In Cambodia we visit, stay with and help 'hands on' for a day with a local NGO project set up to help at risk youth through vocational training and improving the sanitation and basic needs of the local village. Our bikers can choose to make a donation for ongoing work or return to spend more time working alongside the youth of a small town. Where possible we stay with accommodation owned and run by local families. As well as the fantastic social and cultural exchange experienced by visitors and locals alike, our visits also brings a regular income to the communities (by paying for accommodation and other services). Social integration with the local people is a central part of our trips. Simply travelling by bike is a great start – a great way for our bikers and local people to meet and start a conversation. We buy locally grown and produced food as much as possible; we support local businesses by staying in locally owned guesthouses, eating in local restaurants and taking our bikers to local operations and parks.